Searching for History in the Catskills ~ The History Girl! During August of 2014, I had the opportunity to visit Greene County in the Catskills of New York State. This area, a very popular tourist destination from approximately the early nineteenth century through the mid-twentieth century, has been in a steady decline since the 1970s. Once grand hotels now sit abandoned. Even smaller establishments, filled with families enjoying a weekend jaunt to the pristine wilderness of the mountains, now sit vacant and overgrown. As demolition becomes necessary and nature slowly retakes locations that are still standing, there are still traces of infrastructure dating to the early 1900s and can be found in various states of preservation, use, and reuse. At the Mountain Top Historical Society in Haines Falls, a restored train station is used for community events connected by a newly opened rail trail, and remnants of the railroad's infrastructure can be found throughout the area. Ulster and Delaware Railroad Station, Haines Falls, New York, circa 1920. Beginning in the early nineteenth century, a rise in artistic interest led visitors to the Catskill region. Literary figures, artists, and adventurers found the wilderness of upstate New York captivating. The waterfalls and spectacular views, inspired the Hudson River School of art, America's first school of art. The region was popularized by the artistic works of Thomas Cole and Asher B. Durand and the literature of James Fenimore Cooper and Washington Irving. The Hudson River School dominated art for over fifty years, between 1825 and 1875. The artwork inspired a conservation movement to protect the region's resources and by the mid-nineteenth century, presidents and the wealthy came to the region to escape the heat and filth of the cities. In response to this newfound destination and a surge of tourists, large hotels were built throughout the region. In the Mountain Top area, hotels such as the Catskill Mountain House, the Laurel House, Hotel Kaaterskill, the Lox-Hurst, Haines Falls House, and dozens of other smaller hotels and boarding houses were constructed to accommodate the influx of visitors. The Catskill Mountain House, 1892. 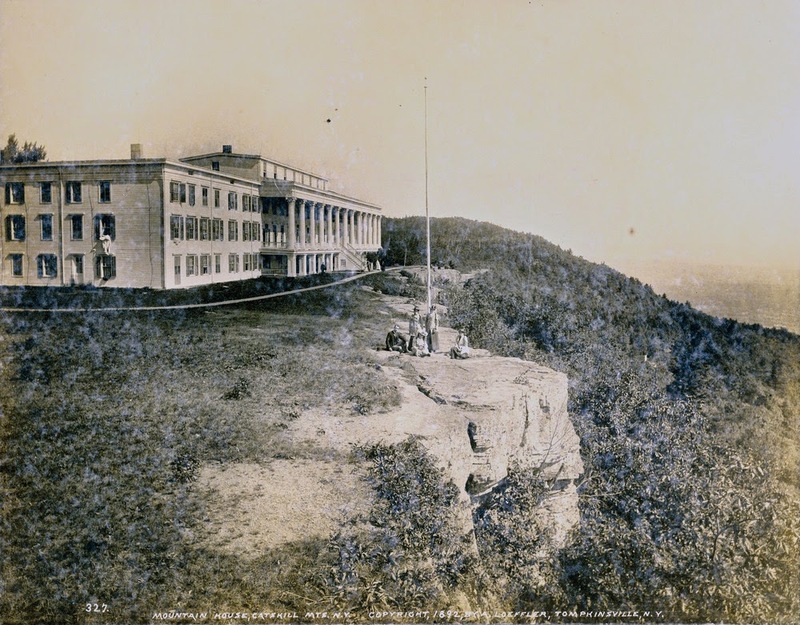 Two of the largest hotels in the area were the Catskill Mountain House, opened in 1824, and Hotel Kaaterskill, built in 1881. Both prospered into the nineteenth century. The massive 612-room Hotel Kaaterskill burned on September 8, 1924 and was never rebuilt. Meanwhile, the Catskill Mountain House operated until 1941. It stood, badly deteriorated, until it was burned down by the New York State Conservation Department on January 25, 1963. World War I and the rise of the automobile, allowing people to travel faster and further, began the slow decline of the Catskill region. Many of the grand hotels saw a decline in visitors and eventually shuttered. Modern hotels, built in the 1950s and 1960s saw success for many years, but never matched the volume of the Victorian period. Winter tourism picked up in the late twentieth century due to the ski industry. The twenty-acre campus of the Mountain Top Historical Society was originally home to the Lox-Hurst Hotel, built in the late nineteenth century. The property became a dude ranch in the second half of the twentieth century. In the main hotel building, a restaurant called La Cascade operated. In the mid-1990s, a fire destroyed the historic hotel building. Shortly after the fire, the property was donated to the Mountain Top Historical Society. Another late-nineteenth/early twentieth century building on the property which had served as a laundry was moved closer to the main thoroughfare, Route 23A. The structure was fully renovated as the Society's visitor center and features displays and panels for the Hudson River School Art Trail. The Lox-Hurst Hotel, circa 1911. This hotel burned in the mid-1990s. Transportation to the region was difficult during the infancy of the resort era. Steamships travelled up the Hudson and dropped visitors in the Town of Catskill. From there, stagecoaches travelled over four hours to the hotels on top of the mountain. Train service slowly made its way into the area. The Ulster & Delaware Railroad, advertised as "The Only All-Rail Route To the Catskill Mountains," began operations in 1875 after being reorganized from the Rondout & Oswego Railroad. Trains took passengers from Kingston, New York west to Phoenecia. The end of the line was in Oneonta. In 1881, the Stony Clove & Catskill Mountain Railroad was organized by Ulster and Delaware management to build a three-foot, narrow gauge line from Phoenicia to Hunter, with a branch, the three-foot narrow gauge Kaaterskill Railroad, to serve the Hotel Kaaterskill and the Catskill Mountain House. Service on the main branch line began in mid-1882 and the Kaaterskill line opened in June 1883. So from Phoenecia, passengers could go north to Kaaterskill Junction and from there either west to the town of Hunter or east toward Tannersville, Haines Falls, Laurel House, and Kaaterskill. Stations were built along the branches. The original Haines Falls station was replaced in 1913, coincidentally the peak passenger year for the Ulster and Delaware, with 675,000 passengers. The Stony Clove & Catskill Mountain Railroad was formally taken over by the Ulster & Delaware in 1893, and all branches were converted to standard-gauge between 1898 and 1899. On February 1, 1932, the Ulster and Delaware became the Catskill Mountain Branch of the New York Central Railroad. In 1940, the Hunter and Kaaterskill branches, the former narrow gauge lines, were abandoned. The preserved 1913 Ulster and Delaware Railroad Station, Haines Falls, New York. Today, there are only two surviving stations on the former branch lines. The Hunter Station is now a private dwelling and the Haines Falls Station is owned by the Mountain Top Historical Society. The Haines Falls Station was relocated from its original location, closer to Route 23A, to a new location along the original right-of-way on the Historical Society's campus. The station is fully restored and is listed on the National Register of Historic Places. A 1.5 mile portion of the right-of-way in Haines Falls opened as the Kaaterskill Rail Trail on June 1, 2013. Remnants of the Ulster & Delaware Railroad trestle abutment and piers can still be seen at the end of Laurel House Road. These stone abutments and piers on each side of Spruce Creek were constructed between 1881 and 1883. Near this trestle stood the Laurel House, a more modest alternative to the other hotels, built in 1852 by Peter Schutt. The Laurel House operated until 1963 and was burned by New York State four years later. Not much of the hotel can be found in the woods today, except for pieces of brick, stone, coal, pipes, and shards of broken china along the eroding near Kaaterskill Falls. Above and below: Remnants of the Ulster & Delaware Railroad trestle abutment and piers, circa 1881-1883. If you look hard enough, you can find the remnants of the Catskills of yesteryear throughout the modern-day Catskills. In the middle of the vast and protected mountain wilderness, lie stones and paths that still have a story to tell.